Installation view of "Fruit and Other Things" at the Carnegie International. A look at the interactive exhibit "Fruit and Other Things"
The Carnegie Museum of Art’s collection is vast. But one of the more obscure facets of that archive has been turned into one of the more popular attractions at the 57th Carnegie International. The 57th Carnegie International continues through March 25. Carnegie Museum of Art, 4400 Forbes Ave., Oakland. “Fruit and Other Things” is a uniquely interactive exhibit by Lenka Clayton and Jon Rubin, Pittsburgh-based artists who find new ways to explore the everyday. Invited to contribute to the museum’s huge, roughly quadrennial showcase for artists from around the world, they focused on lists the museum kept of the titles of artworks – all paintings – rejected in the first several Internationals, between 1896 and 1931. Ingeniously, “Fruit and Other Things” brings the titles back to life in a multi-faceted way. "It's incredibly specific and absurdly general in one title." The completed ledger-sized paintings are then mounted in holders circling the gallery’s four walls. (One day in late November: “Hunter’s Choice,” “Huntress Restraining the Hounds,” “Huron’s Campground,” “Hush, Low,” etc.) Visitors are invited to take one home with them for free, making them owners of certified Carnegie International artworks. Dozens of visitors take home a painting each day, and thousands since the International opened, in October. The 15 in-gallery artists (including Clayton and Rubin) work in shifts; it takes 10 minutes on average to complete a painting, and the artists (who are paid for their work) are pacing themselves so the titles last the whole show, which closes March 25. “The fact that you could walk in and take a piece home with you is like a kind of tiny little miracle that converts someone’s passive viewing experience into this active, almost shopping mentality,” says Rubin, an art professor at Carnegie Mellon University. Like Clayton, he’s an internationally exhibited artist. Rubin says patrons have stood in line for an hour or more for a chance to take a painting home. Lenka Clayton paints one of the 10.632 titles in the show. 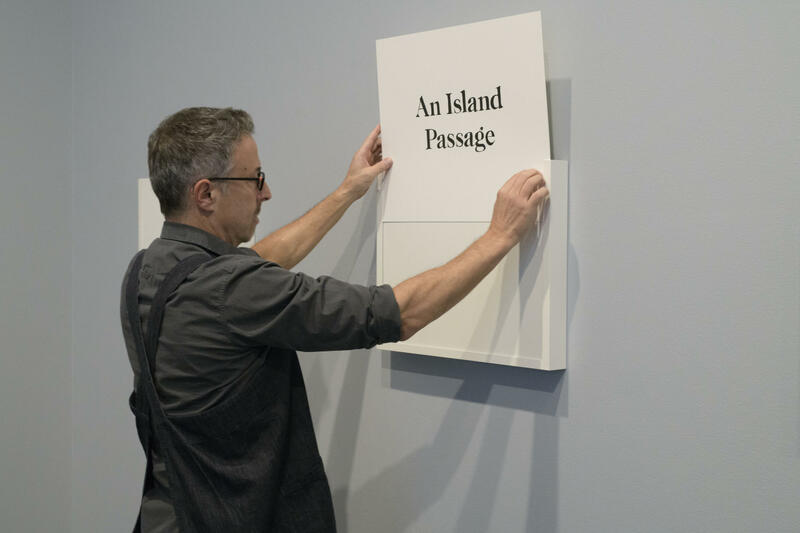 Rubin notes that “Fruit and Other Things” also honors the rejection suffered at some point by every artist, and – in the visible labor of the in-gallery artists – the sheer manual work that so much art requires. But the words themselves inspire, too. One weekday in late November, visitors included Harrison Lee, a Carnegie Mellon University sophomore. "I like to think that the paintings pick the people." “I like to think that the paintings pick the people,” says Rubin. That was certainly true for Geneva Martin, who splits time between Pittsburgh and a home in Ohio but had visited the International several times already. 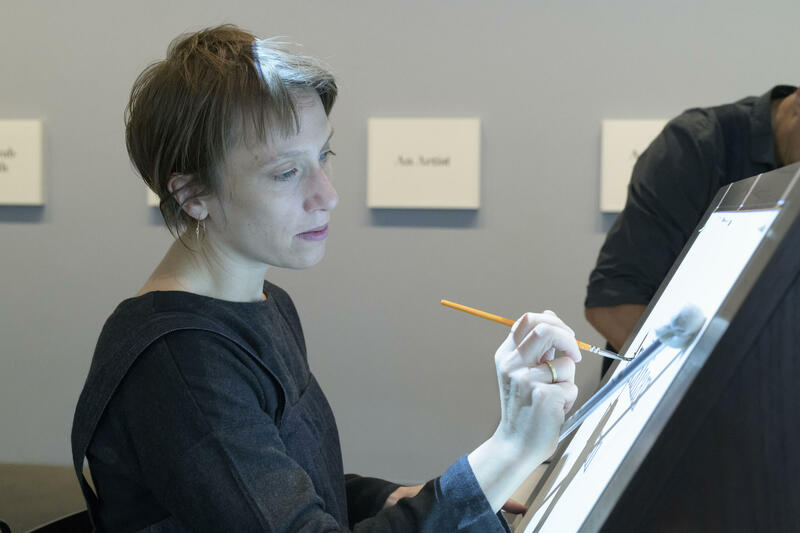 The in-gallery artists who spend hours a day painstakingly tracing the titles say they enjoy the process. Separately and together, Clayton and Rubin in their work often rearrange familiar elements in public spaces to get viewers to reconsider the whole. Rubin’s best-known projects include Conflict Kitchen, a food stall that served dishes from countries the U.S. is in conflict with (its most recent iteration, in Oakland’s Schenley Plaza, closed in 2017.) He also created The Last Billboard, which ran provocative messages on a rooftop in East Liberty. Clayton’s work often interrogates domesticity and motherhood. She’s exhibited a shirt that she decorated with marks from a manual typewriter, and a display of dozens of objects that she removed from the mouth of her infant son. Jon Rubin hangs one of the paintings in "Fruit and Other Things." In 2017, Clayton and Rubin collaborated for New York’s Guggenheim Museum on a project titled: “A talking parrot, a high school drama class, a punjabi TV show, the oldest song in the world, a museum artwork, and a congregation's call to action circle through New York.” They got six businesses and other institutions on an imaginary circle drawn through New York City to swap objects important to them. “We were just trying to look at how culture is made throughout the city, and all these sort of different socioeconomic conditions, and put them into direct conversation with each other,” says Rubin. Another component of “Fruit and Other Things” is that Clayton and Rubin ask patrons to photograph themselves at home with their new art and post the image on the exhibit’s website. “Fruit and Other Things,” in other words, gives the ghosts of thousands of rejected paintings – their titles – new life as accepted artworks. “So it's kind of the exhibition is this moment that looks both backwards and then creates a new future,” says Rubin. WESA receives funding from the Carnegie Museum of Art. The 2018 Carnegie International, which opens Saturday, at the Carnegie Museum of Art, will spotlight work by dozens of artists and artist teams from around the world. But only one of those artists, it’s safe to say, traces his relationship with the museum back to 1968.